Sometimes it’s hard to part ways with your old things, especially if they hold sentimental value. But just like all other objects, they get worn out over time and begin to lose their purpose. Throwing them out straight away might be a hard thing to do, so why not repurpose them into something new? Albeit not exactly like the original, you still get to keep your stuff and restore their usefulness in the process. In a previous post, one of our upcycling workshop participants shared her experience and remarked how lovely the session was. During the activity, they transformed old oak chairs for our Petit Miracles shop. The article showed that anyone can do upcycling and all it takes is the willingness as well as dedication towards a project. So let’s check out fun ideas for redecorating your home. Most of these are simple enough to follow so you don’t have to worry about needing advance techniques and skills just to complete a project. Old lampshade frames can be turned into a coffee table. Use them as the base and simply attach a wooden block for a unique minimalist piece. You can either remove the shade sheets or retain them for a quirkier look. How about taking a piece of your old barn with you in your bedroom? 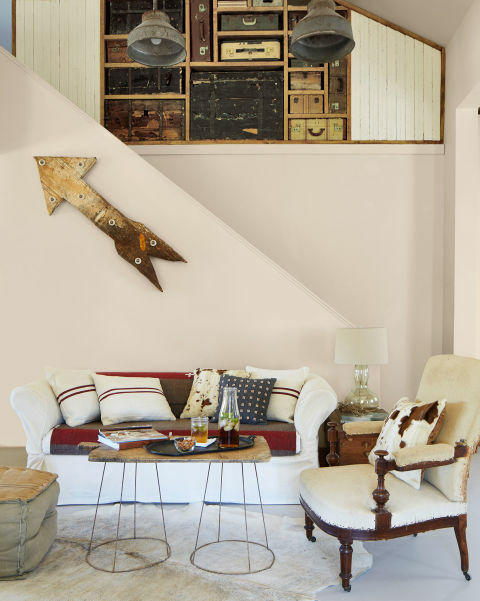 Memories from your childhood can be stirred up through a framed old barn door that can serve as both decor and a nostalgic reminder. Since it’s almost time for ‘Happy Holidays!’ once again, objects that will add to the festive cheer are perfect to complement your Christmas decor. 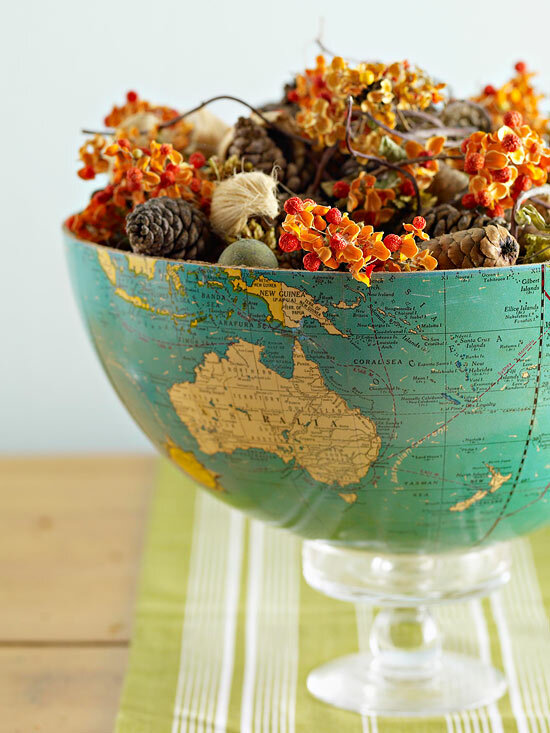 First off, a worn-out, unusable globe can be cut in half and turned into a fruit holder as a table display to give the impression that you enjoy traveling the world. Those paper bags can be morphed into fruit baskets as well. 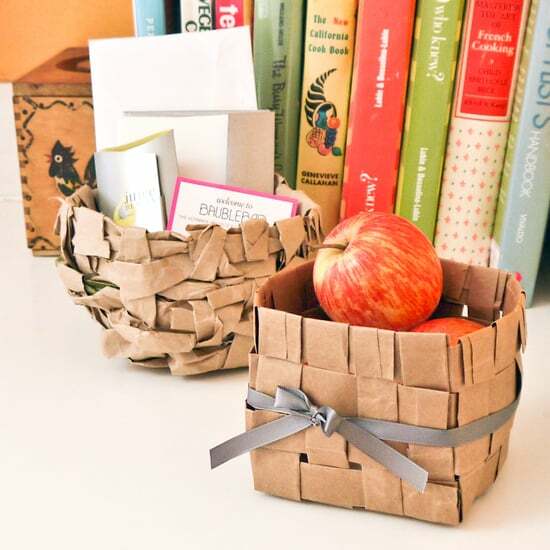 Cut them into strips and with some weaving skills and glue, you can fashion them into rustic-style baskets. Furthermore, vintage magazines and old fabrics are great for making ornaments to hang on your Christmas tree or your walls. Cut out an image of Santa or Rudolph and stick it on a cardstock. Trim the edges and fix a string to the back for hanging. For old fabrics, cut two small identical pieces of your desired shape such as a star or a chestnut. Put some stuffing between the pieces and sew them together. Attach a string at the back as well for hanging. These are just some ideas for upcycling old things into repurposed decor. There are literally hundreds more you can do with all sorts of unused stuff. Just let your imagination and creativity run free. Do you have your own projects that you want to share with us? Leave them in our comments section below.